Kiss Your Commute Goodbye ! 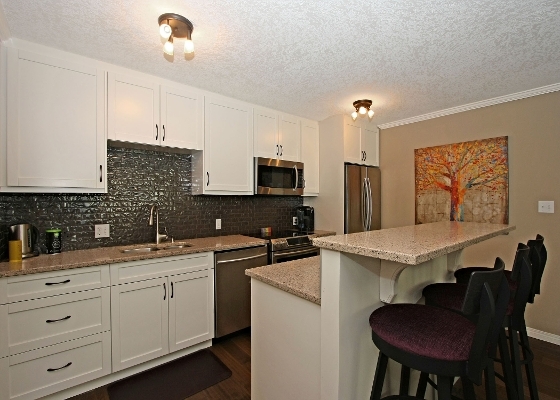 Upbeat Urban Living Minutes from the Downtown Core ! Spectacular NEWLY RENOVATED TWO Bedroom End unit facing QUIET cul de sac in the heart of Mission District. Knockdown Ceilings, Antiqued Maple Hardwoods, Insuite Laundry, Private SOUTH Patio, Assigned Offstreet Parking & a Storage Locker too ! SLEEK Open Plan - Huge Great Room with Dining Area - STUNNING Chef's Kitchen with GRANITE counters, Island, Crisp White Cabinetry, & Upscale STAINLESS STEEL Appliances - X-TRA Large Master, Roomy 2nd Bedroom, & Stylish Main Bath with Soaker Tub & Rainhead Shower. STEPS from 4th Street Shops & Restaurants, Talisman Centre Fitness Facility & Year Round Pathways - Professionally Managed CONCRETE Complex & it's PET Friendly too !